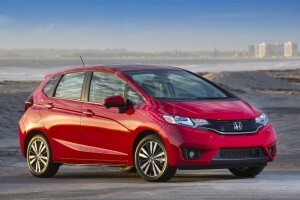 The Honda Fit is a lot of cargo in a small package. Read more in this Expert Review from Edmunds.com and stay tuned for our Pick of the Week including a video of the 2016 Honda Fit! The Fit is unchanged for 2016. Car names often consist of seemingly random words or alphanumeric jumbles, but the 2016 Honda Fit proves that literalism has its place. If there’s one thing this Honda is known for, after all, it’s the incredible amount of stuff you can fit inside its pint-sized hatchback body. Today’s Fit also has more rear legroom than ever, and it’s got a respectable roster of standard and optional technology, too. Throw in excellent fuel economy and you’ve got a uniquely talented vehicle that offers great value in this segment. As ever, one of the Fit’s standout features is its so-called “Magic Seat,” a uniquely constructed rear seat that includes a flip-up seat bottom to facilitate hauling behind the front seatbacks. Alternatively, you can leave that seat bottom down and fold the rear seatbacks forward, which opens up a cargo hold that’ll give some small crossovers a run for their money. If you’re upgrading from an older Fit model, you’ll likely be impressed by newly available upgrades like leather upholstery and keyless ignition. Happily, core Fit features such as nimble handling and excellent visibility remain present and accounted for. There’s nothing else quite like the Fit on the market, but there are a few other subcompact hatchbacks that do certain things well. The funky Kia Soul, for example, actually has a bit more cargo capacity than the Honda, though its fuel economy is distinctly inferior. The 2016 Ford Fiesta hatchback is fuel-efficient and fun to drive, but its backseat and cargo area are both pretty tight. The four-door version of the Toyota Yaris hatchback is a solid offering that compares well on many fronts, but its cargo capacity just isn’t in the same league. At the end of the day, if you’re looking for versatility and efficiency on a budget, no other subcompact comes close to the aptly named 2016 Honda Fit. The 2016 Honda Fit is offered in LX, EX, EX-L and EX-L with Navi trim levels. Standard equipment on LX models includes 15-inch steel wheels, automatic headlights, LED brake lights, cruise control, a height-adjustable driver seat, a tilt-and-telescoping steering wheel, full power accessories, Bluetooth phone and audio connectivity, a 5-inch central display screen, a rearview camera and a four-speaker sound system with a CD player, an auxiliary audio jack and a USB port. EX models add 16-inch alloy wheels, foglights, a sunroof, keyless entry and ignition, a 7-inch touchscreen display, an upgraded rearview camera with dynamic guidelines, Honda’s LaneWatch blind-spot display, a six-speaker audio system with an additional USB port instead of the auxiliary jack, Siri Eyes Free functionality for enhanced iPhone voice control, smartphone app integration (via HondaLink) and an HDMI input (needed for certain HondaLink features, most notably an optional navigation app). Going with the EX-L gets you heated body-color side mirrors, a leather-wrapped steering wheel and shift knob, leather upholstery and heated front seats. The EX-L with Navi adds, not surprisingly, a navigation system (with voice recognition) as well as HD and satellite radio. 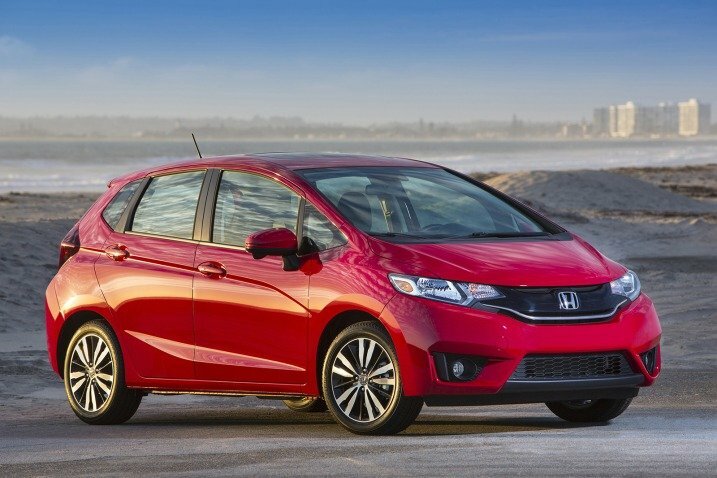 The 2016 Honda Fit features a 1.5-liter four-cylinder engine generating 130 horsepower and 114 pound-feet of torque. A six-speed manual transmission is standard on LX and EX models, while a continuously variable automatic transmission (CVT) is optional on those trims and mandatory on the EX-L and EX-L with Navi. During Edmunds testing, an EX-L with Navi ran from zero to 60 mph in 8.8 seconds, a quicker than average sprint for the subcompact segment. EPA fuel economy estimates for the manual-transmission 2016 Fit stand at 32 mpg combined (29 city/37 highway). The CVT-equipped models deliver 35 mpg combined (32 city/38 highway) except for the entry-level LX, which is the champ at 36 mpg combined (33 city/41 highway). Every 2016 Honda Fit comes standard with antilock brakes (front disc, rear drum), stability and traction control, front side airbags, side curtain airbags and active head restraints. The unusual LaneWatch blind-spot system (standard on EX and above) includes a camera in the passenger-side mirror housing that provides a low and wide view of the blind spot when the right turn signal is engaged. In Edmunds brake testing, an EX-L with Navi came to a stop from 60 mph in 127 feet, about 5 feet longer than average for this class. In government crash testing, the 2016 Fit received a five-star overall rating (out of a possible five), with five stars for total frontal impact protection and five stars for total side-impact protection. In crash tests conducted by the Insurance Institute for Highway Safety, the Fit earned the highest rating of “Good” in the moderate-overlap frontal-offset, side-impact and roof strength tests. In the small-overlap frontal-offset test, the Fit was rated “Acceptable” (second highest). The Fit’s seat/head restraint design was rated “Good” for whiplash protection in rear impacts. The 2016 Fit should be a good fit indeed for most people, though long-legged drivers may wish for more legroom and steering-wheel reach. Every trim level provides a modern-looking dashboard and satisfactory materials quality for this segment. 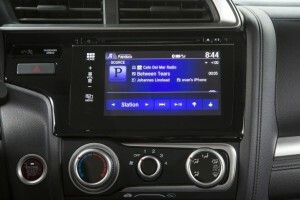 Standard items like USB connectivity and Bluetooth streaming audio help distinguish the current Fit from its more Spartan predecessors. A standard 5-inch color infotainment display adds to the contemporary feel, with an upgraded 7-inch touchscreen included on the EX and EX-L trims. That larger touchscreen comes bundled with the HondaLink system, which adds a variety of search, audio and social media functions. On the EX, it also allows an optional navigation app to be streamed through an iPhone in conjunction with the included HDMI port, though the integrated navigation system on the EX-L is faster and includes voice recognition. Overall, we’ve found the HondaLink menu design to be a little cumbersome, and we dislike its touch-operated volume control and overly involved procedure for setting radio presets. Responses are quick, however, and we appreciate the touchscreen’s swipe-and-pinch functionality. Note that Android phones are currently incompatible with HondaLink, although Honda continues to claim that this will change soon. The Fit has always had a lot more rear passenger space than you’d expect, but the current generation has the most yet. There’s now more rear legroom than in the Accord, which means comfortable seating for two tall adults and/or easy installation of rear-facing car seats. On the hauling front, the cleverly designed 60/40-split “Magic” rear seat continues to set the Fit apart, featuring a flip-up seat bottom that creates a narrow, floor-to-roof compartment for taller items. Folding both rear seatbacks down yields a flat load floor and 52.7 cubic feet of cargo room, a bit less than the last Fit but still about as much as some small crossovers. 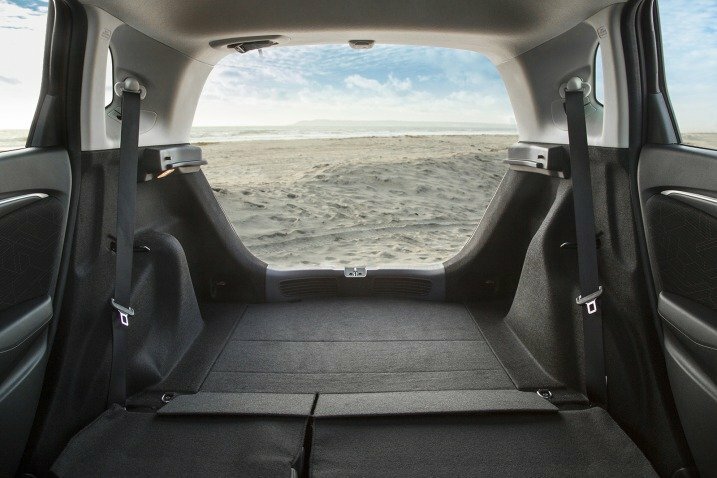 The Fit’s front passenger seat also folds flat to accommodate items nearly 8 feet long. 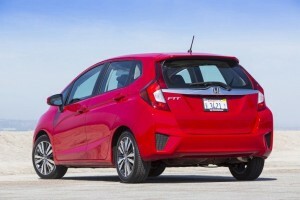 The 2016 Honda Fit has a composure at freeway speeds that was lacking in its forebears. Directional stability is far better, so keeping the car in its lane now requires fewer steering corrections. Road noise is significant, but it’s less objectionable than before and acceptable for this vehicle class. On winding roads, the 2016 Fit feels light and nimble, showing off some genuinely athletic moves within its modest limits. Although the Fit feels snappy enough when driving around town, if you floor the accelerator for highway passing or merging, the CVT causes the engine to drone loudly. Still, this transmission is a slick unit compared to others of its ilk, swiftly “downshifting” on demand but otherwise remaining unobtrusive. The six-speed manual is a pleasure to operate if you like to shift your own gears, but it does exact a penalty at the pump.